It’s Girl Scout Cookie time, people. Perfect anecdote to the winter that never was…or is it? I have nothing against Girl Scouts. I was a Brownie, I earned the cookie badge! But, as an adult with a lens for health and nutrition, I am seriously concerned with these little wafers of minty crack joy. Sugar. Fat. Partially Hydrogenated Fat? High Fructose Corn Syrup? Why oh why?!?! Unfortunately, yes, all in there. Unsafe at any serving. I’m totally on an anti-GS-cookie rant because I was in the lab the other day with a colleague who had just downed an entire package of girl-scout cookies. Not one sleeve. The. Whole. Box. To say the least, I was a bit appalled. The total damage from the entire package? 1120 calories, 56 grams of fat, and 104g of sugar. Just to confirm how horrible this Caramel Delight binge really was, I consulted the ingredients on the side panel. #7: High Fructose Corn Syrup. I know, it’s a COOKIE. It’s obviously not going to be good for you. I get it. But there are ingredients in these particular cookies that you should avoid. Always. The two most offensive: partially hydrogenated oil (trans-fat) and high fructose corn syrup (HFCS). I will address HFCS in future post, and just focus on the fat in this one. The man-made trans-fat. 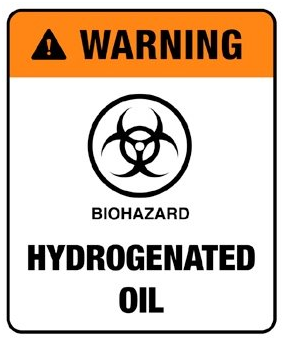 Most people know that trans-fat (called partially hydrogenated oil on the ingredients label) is bad for you. But why are they bad? How bad? And what exactly does “partially hydrogenated” or “trans” fat mean? Fat naturally comes in two forms: saturated or unsaturated. Saturated fats are solid at room temperature (think, butter or the fat on the edge of your steak). Unsaturated fats are typically liquid at room temperature (think, olive oil or fish oil). High saturated fat intake has been associated with increased disease risk (cardiovascular disease, Type II Diabetes, cancer) while unsaturated fat is often associated with decreased disease risk. Classic Bad Fat vs Good Fat. Trans fat, or partially hydrogenated oil, is a man-made (or man-modified) fat. Basically, someone figured out how to throw a few extra hydrogens onto an unsaturated fat to make a saturated fat. (Thus, HYDROGEN-ated). Why would you want to do this? Commercial gain, mostly. Shelf life. Chemistry Lesson: Saturated fats have no double bonds in between their long string of carbons, so they stay solid at room temperature and have a longer shelf life than unsaturated fat. Unsaturated fat can have just one or many double bonds in between carbons. They melt at lower temperatures and are susceptible to damage from heat and light. 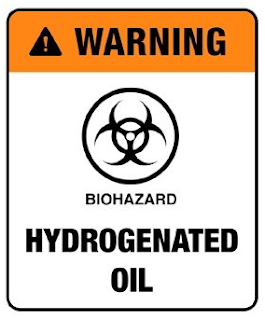 Trans-fats are “partially hydrogenated” because not all of the double bonds are bombarded with hydrogens. The hydrogens that do make it on the fat molecule, however, are put into a configuration not often found in nature. Organic fat is typically in a “cis” formation, where both hydrogens are on the same side of the molecule. This man-modified fat, however, ends up in a “trans” formation, where one hydrogen faces one way, and the other goes in the opposite direction. (Thus, TRANS-fat). These fats are superior even to organic saturated fat for shelf life because they stack very neatly in your food, provide a nice texture, and can sit on the shelf for a LONG, LONG time. 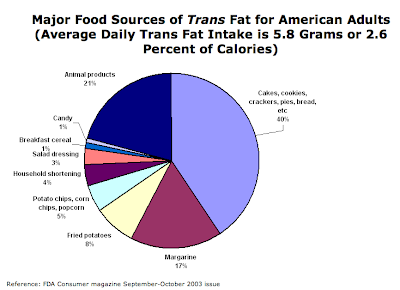 Where do you typically find trans-fat? Well, in pretty much anything that you find in a box or a bag. Fast food french fries, cookies, chips, non-dairy creamers, shortening, bread….bread?? Yup. And peanut butter too (the trans-fats keep the peanut oil from going to the top of the jar, like you would find in an organic brand). Here’s the tricky part. 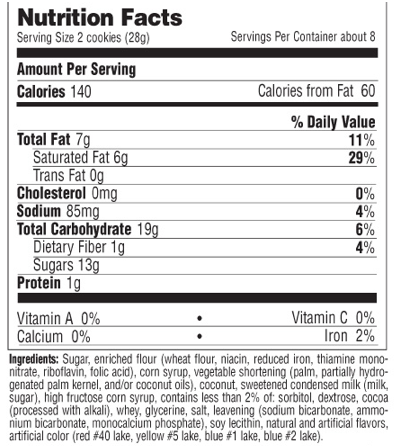 On the Girl Scout Cookies, if you just look at the label (without consulting the ingredients section), it clearly states “Trans Fat 0g”. 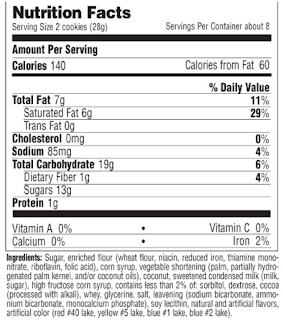 In the ingredients, however, “partially hydrogenated palm, kernal and/or coconut oil” is listed. This is a bit of a trick that the industry is able to use when their products don’t contain a lot of trans fat per serving. In fact, the Food and Drug Administration allows companies to label their packages as “Trans-Fat Free” or “0g Trans Fat” if their product contains less than 0.5g of trans-fat per serving. So, although my friend may have thought he was getting 0g of trans fat from his cookie binge, he actually ate ~4g of these manipulated oils (~2% of total calories, which is important, keep reading). Obviously, most people don’t eat the whole box in one sitting, but even if it took you the entire week to eat each of those sweet indulgences, you are still ingesting this fat. And, even if you are buying products that state “Trans-Fat Free”, you are probably adding to that number throughout the week. It may seem like a small amount, but there are several studies that show even the tiniest bit of these trans-fats in your system (like 0.6% of total calories) can wreak havoc. The major problem is that trans fat increases your LDL (bad) cholesterol and decreases your HDL (good) cholesterol. Even at incredibly small intakes. Trans-fats have also been shown to increase systemic inflammation in your body, demonstrate adverse effects on the ability of your arteries to function properly (vasodilate), and increase the expression of adhesion molecules on your vessel walls that lead to atherosclerosis (hardening of the arteries). All of these effects were seen with very small intake amounts, sometimes even after just one meal containing trans-fat. So, the skinny on the trans-fat? Don’t eat it. Ever. Check the ingredients. If anything reads “partially hydrogenated”, put it back. Sorry, Girl Scouts. Older PostA little pain for a lot of gain...?